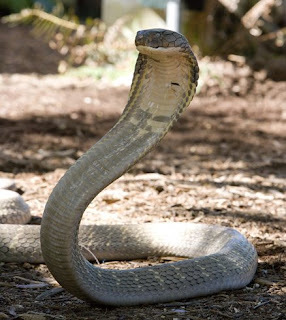 The king cobra (Ophiophagus hannah) can reach up to 18.5 ft (5.6 m) in length and is the world’s longest venomous snake. These snakes live in the forests from India through Southeast Asia to the Philippines and Indonesia. King Cobras prey mainly on snakes and have been know to be cannibalism, feeding on their own species. 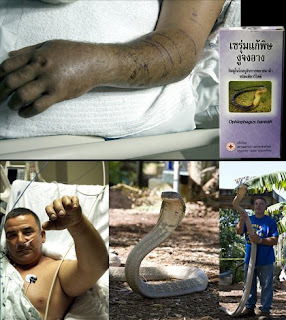 For a long time there hasn’t been any King Cobra bite survivors in Asia. 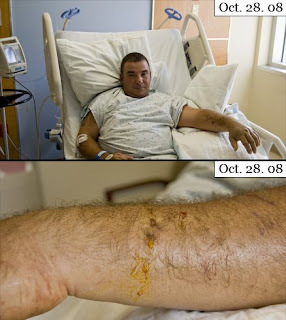 Even with the availability of antivenin, the victims just didn’t made it in time to the hospital. 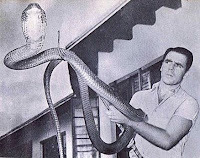 I believe, Bill Haast was the first King Cobra bite survivor in the US. Snake expert Albert Killian made it through the national news again. He spent the first two nights in intensive care. 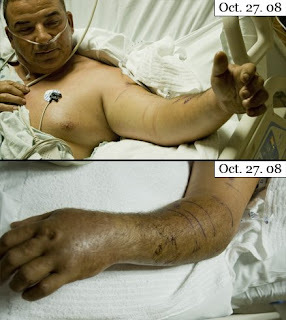 His left arm and hand were swollen, discolored and extremely painful. The fang marks were clearly visible. Still the healing process went quick and the discoloration began fading a few days later. Albert was lucky that he made it to the hospital in time before respiratory failure kicked in. It happened again on the afternoon on Oct. 26. 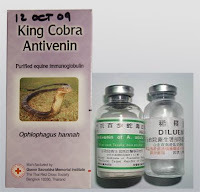 2008, when our long-time volunteer and snake expert Albert Killian, was cleaning out the cage of a thirteen foot Malaysian King Cobra (Ophiophagus Hannah). 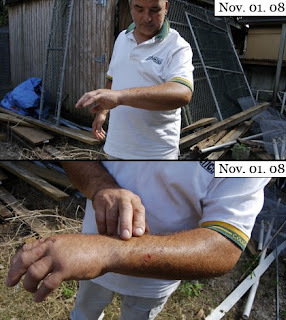 The deadly venomous snake bit Albert in his forearm and kept holding on for a few seconds to chew it’s venom into its victim. Albert was immediately taken to the Homestead Hospital where he received more than 30 vials of anti-venin. The press showed up only thirty minutes later at the hospital but unfortunately Albert was incapable of giving any interviews right away. 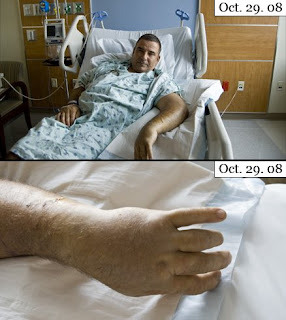 Nevertheless, he gave nonstop interviews the day after until leaving the hospital five days later. Albert went back to his beloved trailer to find a badly needed rest from both - snakes and people.